We have previously written about The Green Wave for cyclists that started on Nørrebrogade street last year. The idea, in summary, is that if you cycle 20 km/h you'll hit green lights the whole way into the city centre. The 35,000 cyclists on Nørrebrogade have taken the wave to heart. The average speed on the stretch - and in Copenhagen in general - was 15.5 km/h. It is now 20.3 km/h where the Green Wave carries the cycling crowds. There are safety advantages in play, as well as general convenience. Cyclists who raced along the route at higher speeds have lowered their pace in order to catch all the lights. Good for safety. The Green Wave has proved to be such a massive success that it has now been extended to two other main stretches leading to the city centre. 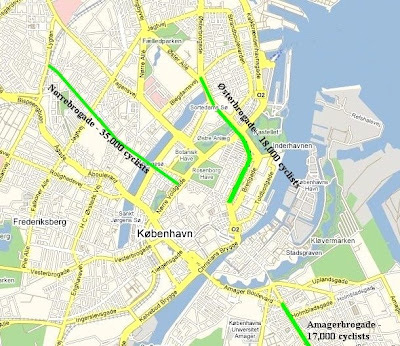 The Green Wave will carry 18,000 cyclists a day on Østerbrogade and 17,000 on Amagerbrogade. The traffic lights are coordinated during the morning rush hour between 06:00 - 10:00/12:00 [depending on the route] and then the wave reverses so the lights are coordinated in the opposite direction between 12:00/15:00 - 18:00 for the trip home. 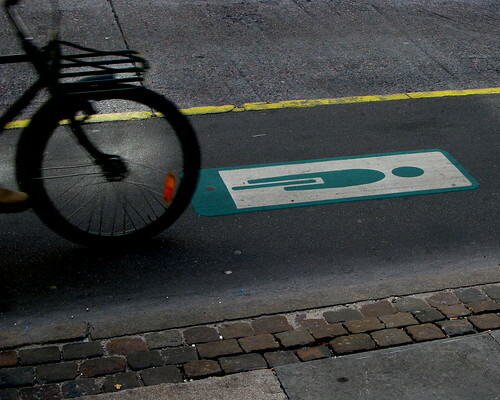 The concept has now been adopted in Amsterdam.